A Halloween event held at the Yumenoshima Tropical Greenhouse Dome, a botanical garden located on Dream Island (Yume no Shima), Tokyo. 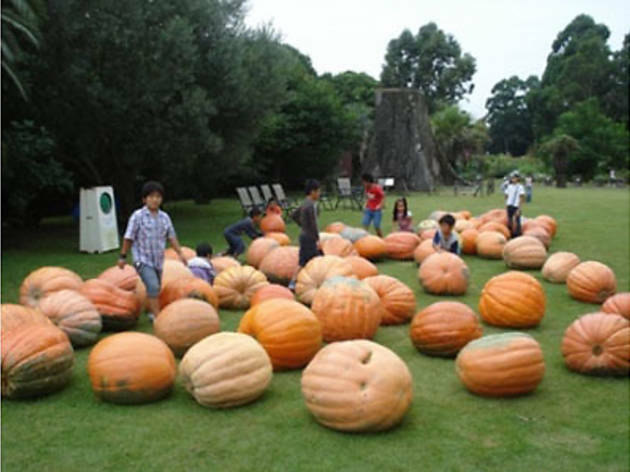 Opening on Thursday September 23 and running until Sunday October 31 the event offers the chance for visitors to view and touch as many as fifty giant pumpkins that each weigh between 50 and 100kg. 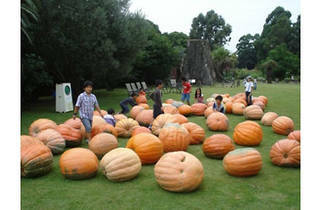 Additionally, on the opening day – Thursday September 23 – there were also three special events: an event entitled ‘Obake Kabocha Concour’, in which the best pumpkins were decided (http://www.yumenoshima.jp/event.php?mode=detail&no=376); an event entitled ‘Obake Kabocha no Tanetobashi Kyoso’, in which contestants competed to see who can spit pumpkin seeds (chosen from one of the giant pumpkins) the furthest (http://www.yumenoshima.jp/event.php?mode=detail&no=377); and an event entitled ‘Obake Kabocha no Korogashi Race’, in which contestants raced by rolling giant pumpkins (www.yumenoshima.jp/event.php?mode=detail&no=378).